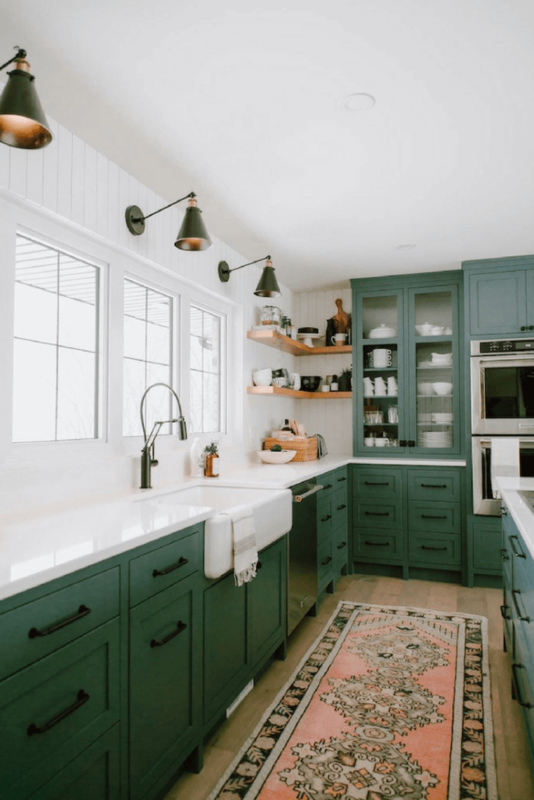 6 Beautiful & Colorful Kitchen Design Trends — KTJ Design Co.
As much as I know you all love white and gray kitchens, color is tiptoeing its way back into the kitchen. Warmth and friendliness will reign since stark white kitchens just don’t cut it anymore. As the economy improves, homeowners will become more daring, and the younger generations (who is buying most of the new homes right now) will soon be willing to take risks. Pro Tip: If you are planning to sell your home and you have beige everywhere, you better switch it up a little. These millennials are all about colors. We love this range from Bertazzoni. It comes in a multitude of colors and, even if you aren’t brave enough to get a wonderful color like this, I suggest you check out their website just for fun. Another fun and colorful appliance brand I love is Smeg. Their appliances have a retro vibe, which I think would look amazing with modern cabinet doors. White marble countertops have run their course, and homeowners are looking for more exotic stones. Color is another factor playing on this new trend. Our most recent kitchen remodel has white cabinets, but we changed it up with brown countertops. I especially like two different colors – one on the island and one on the wall cabinets. While I don’t think white and gray kitchen cabinets will ever fully go away, soft blues and greens will quickly become more popular. In fact, our two latest clients are going with blue and green (respectively). Another great idea, if you aren’t able to commit entirely to a bright color, is to do a dark cabinet color on the bottom, like blue or green, and stay with the white upper cabinets. No longer destined for a completely utilitarian function, sinks are coming on strong as a design element. Different design elements, such as copper and bright colors, are big in Europe right now and will be making their way to the United States shortly. Whether you decide to put them on the floor or use them as a backsplash, artisan inspired cement tiles (now offered as convenient and affordable ceramic tiles) are a beautiful option for a variety of décor aesthetics. The pleasant mix of geometry, gentle curves and floral embellishments will never go out of style (read this blog to find out why). Get them in inky hues of gray or black to stay ahead of the design curve. If you want to join me for more trendspotting, hop on my mailing list here. We’ll keep you updated on the latest and greatest in design and décor news.